Virginia bed and breakfast inns reflect the historic charm of this state. One of the original thirteen colonies, this state is home to Williamsburg, the Washington DC suburb of Alexandria, the naval center at Norfolk, the scenic Shenandoah Valley, and dozens of spacious horse farms. Thomas Jefferson, George Washington, and James Monroe chose to make their home here. You can make yourself at home in this lovely state - if only for a weekend - at a lovely bed and breakfast inn. Northern Virginia, just across the Potomac River from Washington DC, includes the historic Old Town in Alexandria as well as Mount Vernon, George Washington's home and Arlington National Cemetery. The area is rich in history, antique shopping, excellent restaurant, and scenic vistas along the river. 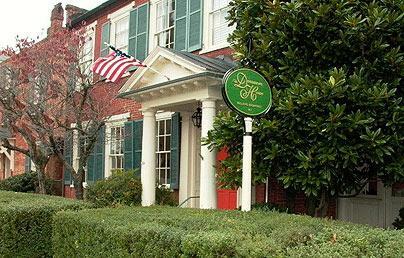 Morrison House - This 45-room hotel in Alexandria's historic Old Town offers the intimacy and charm of a bed and breakfast paired with the luxury of an upscale, boutique hotel. Morrison House is housed in a charming 18th century townhouse. Guest rooms are luxuriously furnished with four-poster beds and other period antiques, brass chandeliers, and decorative fireplaces. In-room spa services are available, as are special pet-friendly packages for those who travel with their dogs and who want to ensure that their pets are pampered in style. Guests can enjoy free in-room wi-fi and a complimentary wine reception from 5 - 6 pm nightly. 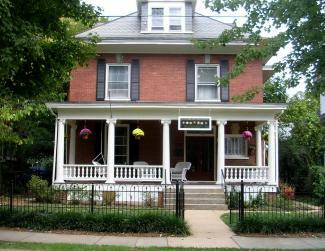 Peake-Fairfax House - This Alexandria bed and breakfast is housed in a federal-style townhouse built in 1816. Throughout its rich history, the townhouse has served as private residence, a medical office, and - now - a bed and breakfast. The home is beautifully outfitted with period furnishings. There are two guest suits, both of which are located on the third floor and are accessible only by stairs. wi-fi is available in the guest suites. The drawing room is open to guests at any time during their stay, as is access to refreshments in the kitchen and a private garden area. Off-street parking is available with advance notice. The Shenandoah Valley in western Virginia is nestled between the Blue Ridge Mountains and the Allegheny Mountains along the Virginia/West Virginia border. It is one of the most scenic areas of the state and home to the Shenandoah National Park, Skyline Drive and Luray Caverns, as well as the historic cities of Roanoke and Staunton. Frederick House - Located within walking distance of Staunton's historic downtown districts and the numerous antique store and restaurants located there, the Frederick House is a collection of five carefully restored 19th century residences, housing 23 spacious guest rooms and suites. All accommodations are decorated with period antiques and feature air conditioning and cable TV. Some units include fireplaces, separate living rooms, and private decks and balconies. Rose Hill Bed & Breakfast - Located in beautiful Roanoke, Virginia, Rose Hill Bed & Breakfast is a lovely home base for any trip to the Shenandoah Valley. The lovely antebellum style home was built in 1910. The current owner purchased the property in 2006 and opened it to the public as a bed and breakfast with three guest rooms following an extensive restoration and renovation project. Guests can partake in daily afternoon tea with hors d'oeuvres and enjoy homemade chocolates nightly. There is also a lounge stocked with popcorn and a microwave oven. There is a library where guests can curl up with a good book and a parlor for television and DVD viewing. In room massage treatments are available by appointment, as are portrait sittings. Central Virginia includes the state's horse country and many of its burgeoning wineries. Located in the shadow of the Blue Ridge Mountains, this lovely area is home to Thomas Jefferson's home, Monticello, Charlottesville, the University of Virginia, and historic Richmond, the former capital of the Confederacy. The region also includes a number of charming Virginia bed and breakfast inns, a great way to get a feel for "Old Virginia" history, food, and hospitality. Dinsmore House Inn - This gracious 19th Century Charlottesville home was designed by Thomas Jefferson's builder. The eight-bedroom Federalist townhouse features a bricked courtyard where afternoon refreshments are served as well as a pool, hot tub, and fitness room. Accommodations are furnished in period antiques and include private baths and air conditioning. A full Virginia breakfast is included in the rate. The Kensington B & B - Located in the historic museum district of Richmond, The Kensington B & B provides lovely accommodations in a beautiful home built in 1919. There are two guest suites in the main house, as well as carriage house accommodations. Each guest room has wi-fi, as well as an HD television with cable. Guests can enjoy a wonderful homemade breakfast featuring traditional favorites like bacon, eggs, grits, pancakes, pastries and more. The Virginia Tidewater region includes the first settlement at Jamestown as well as historic Colonial Williamsburg, once the capital of Virginia; the battlefield at Yorktown; the resort city of Virginia Beach, and the Navy's port of Norfolk. Historic plantations still stand along the James River. The living is relaxed and easy along the Tidewater. Fox and Grape Bed and Breakfast - This two-story Colonial inn is situated just five blocks from Williamsburg's restored area. Guest rooms are decorated with antiques, folk art, and handmade quilts. A sweeping wraparound front porch is the ideal place to relax after a day of sightseeing. Before heading out to see the sights you can enjoy a delicious homemade breakfast, served daily in the dining room. 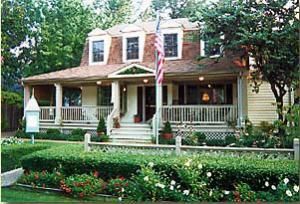 Beach Spa Bed & Breakfast - If you're looking for a relaxing beach getaway, you're sure to find this Virginia Beach bed and breakfast to be a wonderful home base. Visitors have an opportunity to enjoy a true spa escape experience tucked away in a cozy 1937 beach cottage that features eight guest rooms. Each room has a private bathroom with special spa features, wi-fi access and HD televisions with cable. There is a spa in the third-floor tower, as well as an outdoor heated spa pool that is open all year. Several types of massage appointments are available on-site, as well as facials. Virginia is filled with history, scenery, antiques, and southern charm. Staying in a bed and breakfast allows visitors to glimpse a bit of the state's past as well as get to know the present from your gracious resident host. Your Virginia B & B experience will provide you with an opportunity to enjoy true southern hospitality in comfort and style.